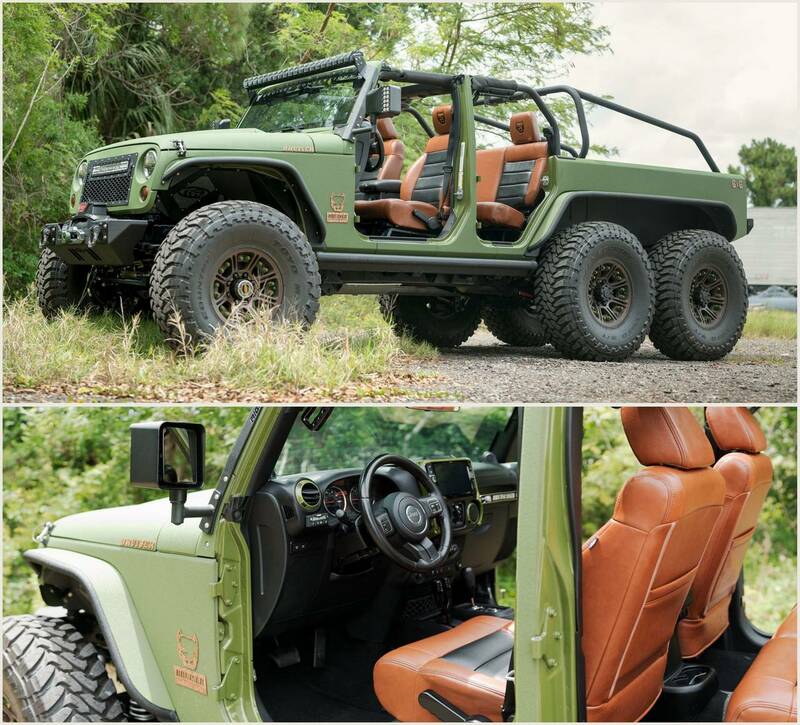 US based customizers have modified a Jeep Wrangler and mated it to 480 HP producing V8. 6X6 vehicles probably haven’t got the right amount of following among fans, which they potentially deserve! Though highly capable in off-roading, there aren’t many vehicles which one finds on the roads. Partially, one can blame the situation to the lack of options, limiting to the likes of Mercedes Benz G63 & Hennessey Velociraptor 6×6 and partially to the high price tags these machines come along with. However, Florida based Bruiser Conversions plan to change things around, primarily for the enthusiasts in the US. 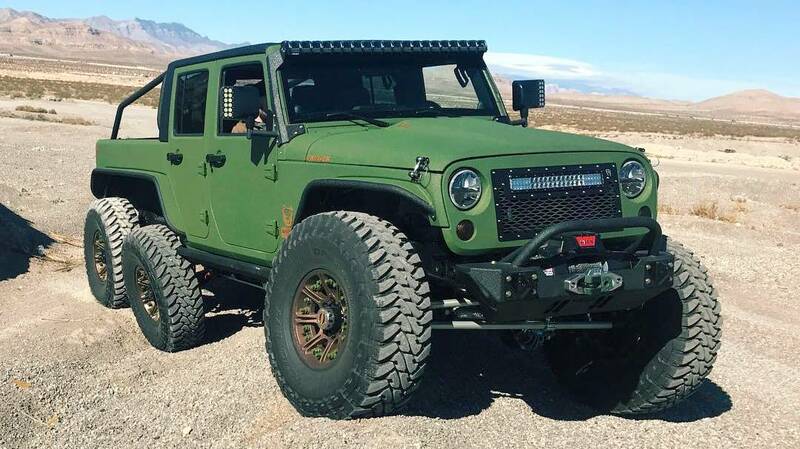 They have taken a Jeep Wrangler JK and turned it into a 6X6 beast and needless to say it has been a head-turner since its debut at the 2017 SEMA show in Las Vegas. 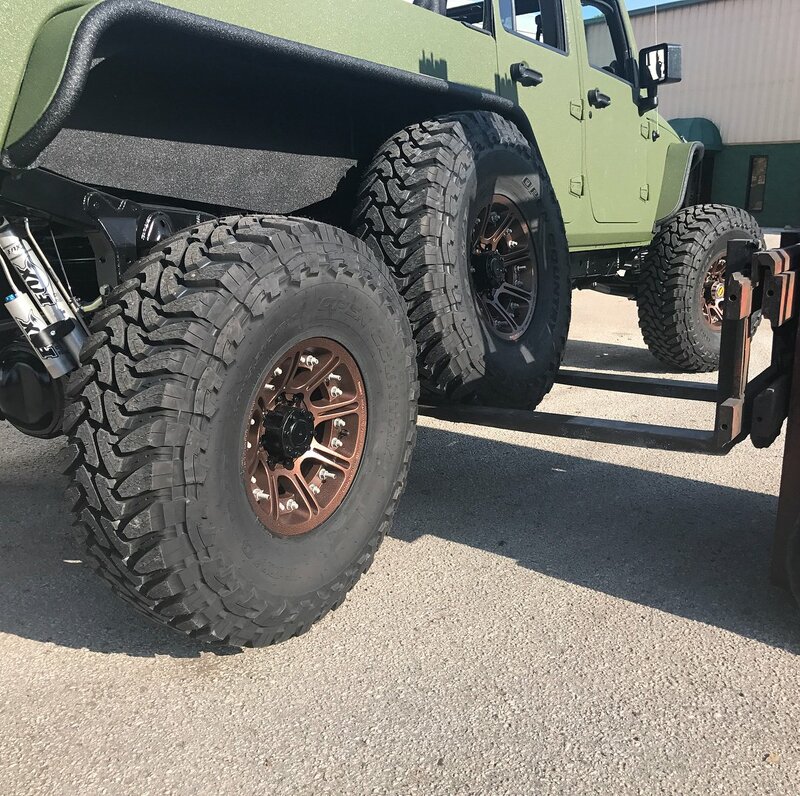 The modified Jeep has a longer body so that it can accommodate the additional axle, an open bed at the rear, increased ground clearance, customized suspensions, special alloy wheels, highly capable Mickey Thompson off-road tires and a winch at the front. The 6X6 machine comes along with a neatly done matte green paint job on the outside. Bruiser Conversions have also added new side mirrors with LED turn signals, steel bumpers and an optional light bar mounted on the A pillars. However, it isn’t just the exterior which has been modified. Bruiser Conversions have tastefully chosen a GM sourced LS3 V8 engine, which churns out 480 hp and have mated it to an Atlas 3.0 transfer case to power the mighty 6X6 beast. Just in case, if one isn’t too fond of the LS3 V8, the customizing house can also install a Hemi V8 or a Cummins Turbo diesel engine, as per the desire of the customer.